This article is a short summary of Kirby's Extra Epic Yarn. Kirby's Extra Epic Yarn is a 2D platforming game and a port of the 2010 Wii title Kirby's Epic Yarn. The game will be released for Nintendo 3DS in March 2019. One ticked-off sorcerer just banished Kirby, warping the poor puffball to a yarn world in need of saving. The twist? Having a yarn body is epic! Kirby can transform into knitted wonders like tanks and flying saucers. Plus, his new ravel abilities mimic his classic copy abilities, adding something new to every stage of this action-adventure game! Ravel abilities allow Kirby to drop buttons like bombs or wield a wire like a sword. And that's just the beginning of all the makeshift magic. Dead end? Unzip a secret passage. Too dark? Unbutton the night to shed some light. Boss blocking your way? Unravel its face! As you play, you'll collect decorative treasures for Kirby's Pad. Show yours off with the StreetPassTM feature! If story mode isn't tough enough, see if you can earn more collectibles in Devilish Mode. In this harder mode, you must survive without invincibility as devils obstruct your path through each stage. There are also all-new minigames starring Meta Knight and King Dedede! Gameplay is largely identical to the original game, in which the player traverses stages using Kirby's yarn abilities, and will receive a ranking at the end based on how many beads they have collected. New to this version of the game are Ravel abilities, which are based on and operate similarly to the Copy Abilities featured in other games; these can be obtained from certain enemies in stages. Stages can also be played in "Devilish Mode", in which a devil-like creature will appear to attack Kirby; this enemy cannot be grabbed with Kirby's Yarn Whip, but can be attacked, which will cause it to release beads and retreat for a time. However, if Kirby is damaged five times in this mode, he will be defeated, and the player must restart the stage. Unlike the original game, Kirby's Extra Epic Yarn does not feature cooperative play; however, Prince Fluff will appear in stages to assist the player or give them extra beads. The game also features two new side modes. In Dedede Gogogo, players control King Dedede as he automatically charges through stages under a time limit. In Slash & Bead, players control Meta Knight in automatically scrolling stages, collecting beads and defeating enemies to earn the highest score possible. Players can also share their layouts for Kirby's Pad through StreetPass. By scanning an amiibo for the Kirby series characters during gameplay, Kirby will gain special variations of Ravel abilities that feature a mask of that character. 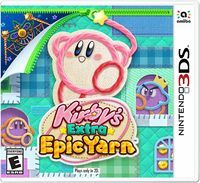 A demo for Kirby's Extra Epic Yarn was released for download on the Nintendo eShop in Europe on February 7, 2019, and in North America on February 21, 2019. The demo requires 827 blocks to download, and has 30 uses. The demo version allows players select one of two stages to play: Fountain Gardens and Rainbow Falls. Both stages can be played in either Normal Mode or Devilish Mode. After clearing a stage, the player can either return to the title screen by pressing X, or go to the Nintendo eShop by pressing Y. ↑ Nintendo of America on Twitter (March 5, 2019). Retrieved March 5, 2019. ↑ 毛糸のカービィ プラス 紹介映像. Nintendo 公式チャンネル (YouTube; February 6, 2019). Retrieved March 5, 2019. ↑ Nintendo UK on Twitter (January 13, 2019). Retrieved March 5, 2019. ↑ Nintendo AU NZ on Twitter (March 4, 2019). Retrieved March 5, 2019. ↑ 한국닌텐도, 닌텐도 3DS 시리즈 전용 소프트웨어 「털실 커비 이야기 플러스」 정식 발매. Nintendo.co.kr (February 13, 2019). Retrieved March 5, 2019. ↑ Nintendo Download for February 21, 2019 – North America. NintendoFuse (February 21, 2019). Retrieved March 5, 2019. This page was last edited on 8 March 2019, at 16:34.